Bop It XT takes the fun and skill of the original Bop It to a whole new dimension! This all-action game involves flicking, twisting, and spinning the Bop It to try and complete all the new games. Follow the directions and you'll get to the next level, but you'll need to concentrate as the instructions get faster and faster. You can play on your own, head to head with another player, or even in Pass It or Party mode with a group of friends. It's a whole new challenge every time you play! How does the Bop It! XT work? 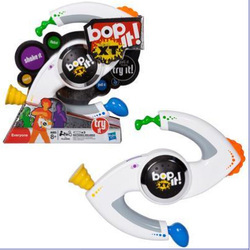 You can practice Bop It! XT on your own, or get a group of friend together and see who's the best at Bop It! 3 volume levels - Quiet, Loud and Blasting - and a headphone socket for quiet play! Who Invented the Bop It? The original Bop It concept was patented by Dan Klitsner and licenced to major toy manufacturer Hasbro, who developed the line further. The original BopIt came out in 1996, and this popular kid's toy has evolved into the Bop It XT, released in July 2011. Like this Christmas toy for a boy but want something more outdoors-y? Look at the new Nerf Nite Finder!